Veuve Lafontan & ses Enfants, a craft company, has ancestral know-how and pays full attention to its eaux-de-vie. "In our cellars time is suspended, patience is our ally." The eaux-de-vie are aged in pedunculate oak barrels. Thanks to the burning of the pieces and the tannin of the wood, unsuspected aromas are revealed and explode after maturation. 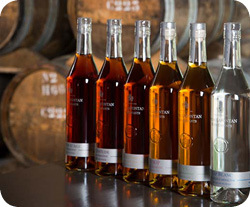 Each Armagnac is unique. Taste them is to discover treasures of diversity and complexity. All Armagnacs are packaged in canisters and graded from 1969 to 1888. Maison Veuve Lafontan & his Children is in the heart of South West France, in the center of the triangle Bordeaux, Pau, Toulouse.